I was born on May 5, 1864 as Elizabeth Jane Cochran in Cochran's Mills, Armstrong County, Pennsylvania. As a child, I wore a lot of pink and was thus nicknamed "Pink" by my family and friends. My father, Michael, a wealthy former associate justice, died when I was six years old. My mother remarried three years later, but it was a bad marriage and she sued for divorce when I was only fourteen years of age. I testified in court against my drunken, violent stepfather. I attended boarding school for one term, but was forced to leave due to lack of funds to pay the school fees. In 1880, we moved to Pittsburgh. A chauvinistic column in the Pittsburgh Dispatche angered me. I wrote a blistering rebuttal to the editor and signed it with "Lonely Orphan Girl." The editor was so impressed with my intensity and fortitude he hired me to work for the paper. 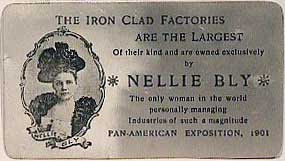 Female newspaper writers at that time customarily used pen names, and I chose "Nellie Bly" which I borrowed from the popular song "Nelly Bly" by Stephen Foster. My early work centered on the plight of working women, and I wrote a numerous investigative articles on the hardships faced by female factory workers. Editorial pressure, however, forced me to cover the more traditional topics of fashion, society, and gardening, for female reporters back then. Dissatisfied, at the age of twenty-one, I traveled to Mexico as a foreign correspondent. There, I reported on the lives and customs of Mexican people. In one report, I protested the imprisonment of a local journalist who had criticized the Mexican government. Mexican authorities threatened to arrest me, and this prompted my hasty departure. Back in Pittsburgh, I was once again made to report on theater and arts. Displeased, I quit the Pittsburgh Dispatch and moved to New York City. Penniless after four months, I talked my way into the offices of Joseph Pulitzer’s newspaper, the New York World, and was offered a very interesting undercover assignment. I agreed to feign insanity in order to investigate reports of brutality and neglect at the Women's Lunatic Asylum on Blackwell’s Island. After practicing deranged expressions and behaviour, I checked myself into a working-class boardinghouse. Immediately I caused trouble. I refused to go to bed, telling the boarders that I feared them because they looked mad. It did not take long for them to deem me as crazy. The next morning they summoned the police who brought me before a judge. I pretended to have amnesia and the judge concluded I had been drugged. Several doctors were brought in to examine me. They all declared me insane, a hopeless case. The head of the insane pavilion at Bellevue Hospital pronounced me undoubtedly insane. My case attracted a great deal of media attention. Committed to the asylum, I experienced its conditions firsthand. The food consisted of gruel broth, spoiled beef, bread that was little more than dried dough, and dirty undrinkable water. Dangerous patients were tied together with ropes. Patients were made to sit for much of each day on hard benches with scant protection from the cold. Waste was all around the eating places. Rats crawled all around the hospital. The bathwater was frigid, and buckets of it were poured over our heads. The nurses were obnoxious and abusive, telling the patients to shut up, and beating us if we did not. Speaking with my fellow patients, I was convinced that some were as sane as I was. After ten days, at the behest of my newspaper, I was released from the asylum. My report, later published in book form as Ten Days in a Mad-House, caused a sensation and brought me lasting fame. While embarrassed physicians and staff fumbled to explain how so many professionals had been fooled, a grand jury launched its own investigation into conditions at the asylum, inviting me to assist. The jury's report recommended the changes I had proposed, and its call for increased funds for care of the insane prompted an $850,000 increase in the budget of the Department of Public Charities and Corrections. They also made sure that all of the examinations were more thorough so that only people who were actually insane went to the asylum. In 1888, I suggested to my editor that I take a trip around the world, attempting to turn the fictional Around the World in Eighty Days into fact for the first time. A year later, at 9:40 a.m. on November 14, 1889, and with two days' notice, I boarded the Augusta Victoria, a steamer of the Hamburg America Line, and began my 24,899-mile journey. I brought with me the dress I was wearing, a sturdy overcoat, several changes of underwear and a small travel bag carrying my toiletry essentials. I carried most of my money (£200 in English bank notes and gold in total as well as some American currency) in a bag tied around my neck. The New York newspaper Cosmopolitan sponsored its own reporter, Elizabeth Bisland, to beat my time. She would travel the opposite way around the world. To sustain interest in the story, my newspaper organized a “Nellie Bly Guessing Match” in which readers were asked to estimate my arrival time to the second, with the Grand Prize consisting of a free trip to Europe and spending money. During my travels around the world, I communicated by way of short progress reports by telegraph or by regular post. I travelled using steamships and railroad, visited a leper colony, and even bought a monkey. Seventy-two days, six hours, eleven minutes and fourteen seconds after my departure, I was back in New York, having circumnavigated the globe. My nemesis, Bisland, was still going around the world. My journey, at the time, was a world record. In 1895 I married millionaire manufacturer Robert Seaman, 40 years my senior. I retired from journalism, and became the president of the Iron Clad Manufacturing Co., which made steel containers such as milk cans and boilers. 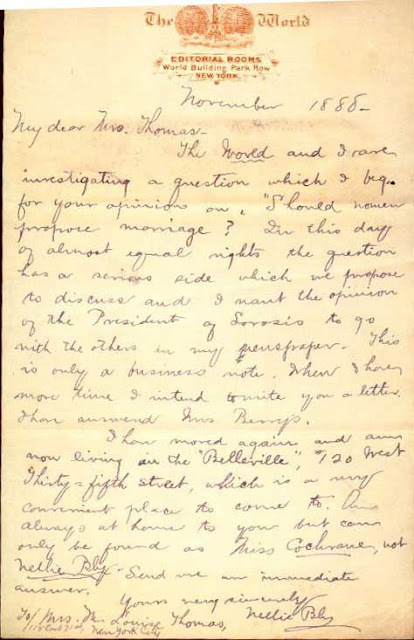 In 1904, my husband died. For a time I was one of the leading female industrialists in the United States, but embezzlement by employees forced me into bankruptcy. I was forced to return to reporting where I covered woman’s suffrage and stories of World War I. In 1916 I was given a baby boy whose mother requested I see that he become adopted. The child was illegitimate and difficult to place since he was half-Japanese. The boy spent the next six years in an orphanage. When I became ill towards the end of my life, I requested that my niece, Beatrice Brown, look after the boy and several other babies in whom she had become interested. I died of bronchopneumonia at St. Mark's Hospital in New York City in 1922, at age 57, and was interred in a modest grave at Woodlawn Cemetary in the Bronx. Wow!!!!! What a gal! Has anyone wrote a novel about her? I would love to read one. I had heard the name but did not know much about her, very interesting. 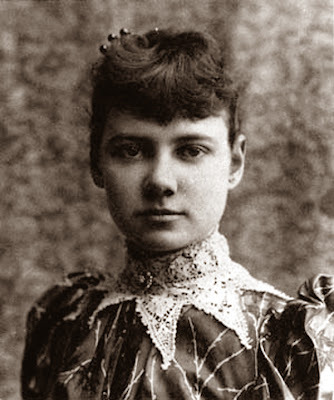 Nellie Bly is awesome! We read excerpts from her article about the insane asylum in my 5th grade language arts class.